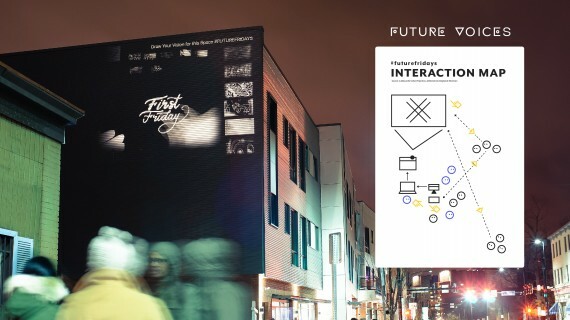 ‘Future Fridays’ was an interactive urban projection experience designed to activate unused and underutilized spaces around Pittsburgh, PA, the USA by crowdsourcing community visions for the future and projecting them into vacant spaces. Urban projection, as the name implies, involves projecting images onto large surfaces in an urban environment, specifically the sides of large buildings. In order to test this as an effective tool for collective futuring, we hosted an interactive urban projection event during the First Friday Festival — a monthly street fair held in Bloomfield where vacant spaces are transformed into art galleries and performance spaces. We called our projection event Future Fridays and set up our equipment in a vacant lot along Penn Avenue, the main street in Bloomfield, and invited participants to draw their visions for the future of that space. Then we would project their drawings onto the side of one of the buildings that bordered the lot and then record their reactions. This event was the result of an extended design and research project looking at how technology might create impact in communities around Pittsburgh. Equipped with insights from our observation, interviews, and exploration into neighborhoods struggling with issues of vacancy, we developed a framework to understand how we might empower community members to take control of their unused spaces. Our goal was to help gather, inspire and empower communities to collectively imagine their own future by providing a concrete, visual medium to express their visions. The Urban projection was our attempt to do that, and Future Fridays was our first experiment towards this end. A substantial amount of equipment was involved to facilitate the experience. The setup included a lightbox, sheets of cellophane and a webcam which were all used to capture the users’ drawings in real time. Then we fed the video back into a computer and finally, into the projector. Participants were able to see their drawings in real-time, which were also animated through simple transform manipulations. All drawings showcased to attract more residents in our canvas during the event. The event attracted an audience of over 50 enthusiastic participants. People were excited to see their work projected into physical space, however, most of their drawings were playful self-expression rather than visions of the future. This perhaps highlighted the limitations of the medium we had chosen, but it also suggested that futuring skills may need to be taught or practiced. If the future is abstract and therefore challenging to imagine, how might we motivate people to imagine a potential future for their communities? However, we were excited to discover that young children seemed to be naturally imaginative and genuinely excited about expressing their visions for the future. Once we saw how quickly many of them took to this work, we began wondering how we might make this work more accessible for use in a classroom with an iniative called “Future Voices”.